How Did Jesus Christ Teach? The teaching mode of the Savior was varied. He used a number of different ways to teach the people He encountered about God the Father. One of His favorite methods was to tell a story. These stories are often called parables. Jesus Christ used parables to reach people at a variety of levels. Those who knew how to and were willing to listen with their hearts were able to pull deep meanings from the stories. Others at least heard a good story. Jesus often used the story to hold his audience’s attention. After the story was told, it was frequently explained. Other times he used them to keep those who did not come with honest intent from learning things they would be held accountable for if they understood. He could give the teachings that brought the most blessings only to those who listened with their hearts. Jesus Christ also taught through sermons, as do ministers today. He would gather those who came to hear him, or sometimes just a select few, and teach them important truths using a variety of methods-stories, sayings, instruction, and warnings or promises. This allowed him control over the content of the lessons, and also allowed him to tailor the material to his listeners. He never tiptoed around the truth during these sermons. He had only a short time to accomplish everything that needed to be done, and he didn’t waste time with jokes, watered down gospel, or anything else that might suggest his sermons was anything less than a matter of eternal life or death. 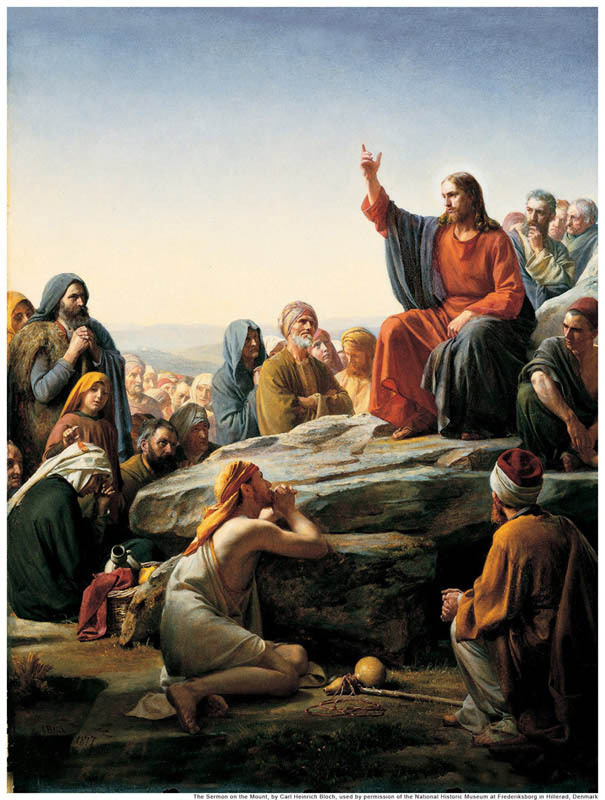 Jesus also taught spontaneously or arranged an informal teaching moment. For instance, when he came upon the woman being stoned, he was able to teach a lesson in only one sentence, when he suggested that the person who was without sin be the first to stone this woman for her own sin. The men understood the message and went away, ashamed of themselves. However, Jesus wasn’t finished teaching. He then spoke with the woman. He told her He didn’t judge her, giving her an important message about her worth before God. Then He instructed her to give up her sins. When Martha and Mary had Jesus as a guest in their home, Martha fussed in the kitchen, making a special meal for their honored guest. She became frustrated because her sister, instead of helping, sat at Jesus’ feet, being taught the gospel. Martha asked Jesus to intervene, and He most likely startled her by suggesting that at this particular moment, Mary was choosing the better part. He wasn’t undermining the need to feed people or care for the home. He was teaching a lesson about choosing your priorities based on the moment. Jesus didn’t care about a fancy meal. He generally lived simply. There would be many days in which Martha could make fancy meals for people, but only a few in which she could sit quietly and learn from the Savior Himself. These powerful lessons were delivered without planning, as the moment arose. He demonstrates to us the importance of being ready to teach at a moment’s notice, taking advantage of what is going on at a given moment. Jesus’ most powerful teaching might be the lessons he taught by example. He made a point of living the way He wants us to live. When He was asked why He would be baptized, when He was perfect, He reminded them everyone was to be baptized. He never exempted Himself from the everyday laws of the gospel. When a group of children were brought to see the Savior at the end of a busy day, the apostles wanted to send them away, because Jesus was tired. However, the Savior called them over and spent important time talking to them and blessing them. He demonstrated through his actions that children mattered, and that a parent or a teacher, no matter how tired or busy he might be, needed to find the time to spend with the children, and most particularly to find time to teach them the gospel. Another way Jesus taught was through miracles. His miracles demonstrated He really was sent by God, but they often taught a lesson, as well. He healed people no one else bothered to respect or worry about. He healed lepers, who were kept away from others. He healed the blind, who, in those days, were generally relegated to begging. He healed the poor and the rich alike. Through these healings of people considered unimportant, He taught us how to treat others. He helped us to understand our responsibility isn’t just to those in our social circle or economic class, but to everyone. By doing so, He gave dignity and importance to those who are often overlooked. One story that demonstrates this respect concerns one of several healings of a blind man. This man was sitting by the side of the road, begging, when he learned Jesus was coming His way. He began to call out to the Master. Others told him to stop. He was a mere beggar, not worthy, they thought, of the Savior’s attention. Jesus, however, felt differently. He called the man to Him and asked Him what He could do for the man. He spoke to the blind man respectfully. Then, after the man asked for his sight, Jesus said the man’s own faith had made him whole. Think of the effect this had on those who watched and listened. Those who had felt the man was unworthy to speak to the Master suddenly learned this overlooked and underestimated man had faith so extraordinary it could bring about his own healing. Did they begin to look at other overlooked and underestimated people differently because of this? It was a great teaching moment that came through healing. Most of the healings we learn of involve people no one else cared about. A Mormon apostle, Jeffrey R. Holland, suggests the physical healings were also a metaphor for spiritual healing, and that Jesus intended for us to also look for those who need spiritual healing for their souls. These teaching methods demonstrate many of the ways we can teach others in our own lives. Jesus was the master teacher, and His stories are made available to us as an example to follow. This website was so helpful. I am in year 8 and had a people project with four set questions to answer. It gave me good answers and i would totally recommend this website to anyone. p.s-thanks to the people that made this website so helpful. Thanks, Grace, for your visit and remarks. Is there any additional information that we can help to provide? Best to you.